Our lives are forever changed all because God reached down to us by sending His Son, Jesus Christ. So, at this time when we often take stock of our blessings and reach out to those who have touched our lives, we are thinking of you. Thank you for being such wonderful Friends of GH & supporters. Here is hoping you and yours had a very Merry Christmas and will enjoy a blessed New Year. I would like to tell you his story. His name is Shalem Kumar. He is from India, 27 years old and a doctor (also the biggest fun-loving kid we have). He just got married to Grace Wilkins on December 4, 2016 so he will not live with us this spring, making the house sad! What God has done is PROVIDE HIS EVERY NEED with miracle after miracle! But you need to understand that of which he is a part, his family history. His grandfather was saved out of Hinduism at age 18 (only believer in his Hindu village). He never attended school of any kind, not one day, but followed the evangelist who converted him for 3 years. He then started his 61 year ministry by returning to his village where he was a criminal and many came to Christ. Grandfather is an evangelist and had four sons. His oldest is Shalem’s father, Steven. Steven felt God’s call and took over direction of the ministry. God used his gifts to start churches and today there are over 100 churches with 35 full time pastors (whom they train). Their vision is 1,000 churches in the next 20 years in the unreached villages where they work. Shalem sensed from childhood that God was leading him to get the Biblical training that neither his father nor grandfather had. 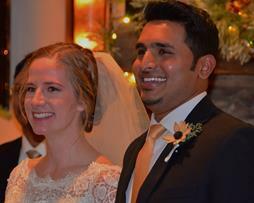 The family sent him to medical school sensing that God would use that to open ministry doors. Shalem will eventually provide the leadership for this ministry that he was named after. Thank you for having a part in this India ministry. Anyone that knows Shalem senses that God’s hand is upon him. You have made it possible for Shalem (by praying and/or giving to GH) to get the Biblical training that will literally affect hundreds if not thousands. I could tell you the story of our other 8 students and alumni. But I won’t. Marianne calls them our “World Changers!” The monthly support at Gatehouse has sunk alarmingly low. We have survived by using reserves and they are nearly gone. We are seeking ministry partners both for prayer and giving. We operate on a monthly budget of $5,500 for eleven people. That is everything, including all salaries, food, mortgage, utilities, insurance (big expense), vehicles, maintenance and repairs, . . . everything! We are running about $1,000 a month short, or $12,000 for the year. Would you prayerfully consider a one time year end gift to help us finish the year strong? We are a 501©3 charity so your gift is tax deductible and as long as your check is dated by December 31 will count toward this years taxes. Thank you so much for your prayers and support of our ministry. We have finally been able to update our email list, and hope to keep in touch with you regularly sharing our praises and prayer requests. “In January of Daniel’s senior year, we thought that Simpson was going to be completely out of reach financially–however, we trusted that if God wanted Daniel there, He would open the doors. We were thrilled when Daniel got a very good scholarship from Simpson in the spring, and when he was accepted to live at Gatehouse, it was complete confirmation that this is what God had for Daniel as he could now afford it! *Having kept in touch with Greg Collord over the years through our mutual prayer letters, we knew of the mentoring ministry that he has had with MKs. Daniel was blessed to attend a TCK Re-Entry Seminar in Ohio, where Greg was the leader of Daniel’s small group. Daniel also appreciated the orientation that Greg did at Gatehouse upon his arrival, and he is hoping to meet regularly with him now that he is at Simpson. Thank you all for your prayers and support. Rejoice with us as we serve in this Kingdom ministry. May God’s abundant Mercy, Grace and Love be with you all!!!! We are grateful for all the generous gifts we have received here at GateHouse. As many of you know we have only just finished our first year at GateHouse. We love working with the students as they attend Simpson University and realize we are just a piece in the puzzle of preparing these world changers for what God has for them. Our students possess a unique skill set because they have lived in cultures that are not their own. Their adaptability, experience and openness give them the compassion and the genuineness they will need to reach out in a cross cultural situation either overseas or here in the US with many of our immigrants. 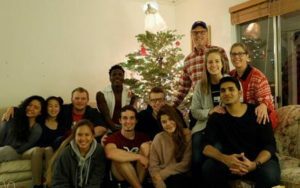 God works mightily in all our students but we wanted to have Salem Kumar share with you (He is in the picture second from the left). My name is Shalem Kumar. I am from India. God has amazingly brought me to the USA to attend Tozer seminary. After finishing my course, I will join my grandfather and father’s ministry that equips, teaches,trains and disciples pastors in India, for His kingdom. Thank you so much for allowing me to be a part of Gatehouse where I am enjoying being with students from around the world that have become my family. It is an honor to not only have your support on this journey but an honor to know that you see the working of God’s hand in India through my family. The monthly support at GateHouse has sunk alarmingly low so we are seeking ministry partners that will join with us in raising up world changers for the advancement of God’s Kingdom. We are asking for those ministry partners to commit to praying for us and to giving $100, $75, $50, $25 or as the Lord leads monthly. Do not wear yourself out to get rich; do not trust your own cleverness.